Sade sati The Time Period of Might Saturn | Are you scared of Me ? Apart from this dasha system , we have 7 planets (Surya to Shani) and 2 shadow planets (Rahu-ketu), 12 Rashi (zodiac signs) and 12 bhav ( Houses). Sade Sati forms when Saturn/ Shani during it’s revolution ( Transit – Gochar) comes to a house which is just previous to the house where your Moon / Chandra is placed. In this above picture, you can see the numbering 1,2,3. 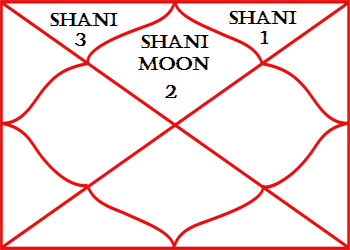 These numbering shows Previous, Natal and Second to Natal position of Shani on Natal Moon respectively. This can happen to any house like here it is present in the Lagan ( where 2 is written). through Lagna we count anticlockwise and rest at the 12th house where number 1 is written ( these numbers are indication for shani position not house numbers). Shani is planet which takes maximum time for 360 degree revolution, It means Shani takes maximum time as compared to other planet’s time to complete a circle of 12 signs. Shani usually takes 30 years 360 degree (12 signs) revolution. This means Shani stays for 2.5 years of time in one house and if you see above picture you will notice that 3 houses ( 2 adjacent and 1 same houses) gets impacted. So 2.5 x 3 = 7.5 years will take to cover 3 houses which are the same houses as above picture. No not at all, Sade Sati is quite different from any dasha. Sade Sati is basically a time period which starts only before 1 house from moon and goes to 2nd house to the same moon( reference above picture). Sade Sati can start with any dasha. So it is very different and independent of any dasha. These are the general terms associated with moon. Because moon being the first karaka of mental peace whenever Shani comes to any houses described above, it creates disturbance in the significance of Moon. This shows when we have Sade Sati started , we tend to feel such kind of indications at different level. For Example : Sometimes you suddenly started feeling dejected or getting sudden loss in professional life. You may start visiting dirty or filthy places. No, Not at all. Sade Sati rely upon everyone’s own kundli. If you have good combinations of moon then Sade Sati will not impact you much in a negative way. If you are running a Dasha of planet which has good relation with moon and Shani then also you will feel good impact during your Sade Sati. One should work on upon his/her sleeping habit. Because Shani is routine. So please be very precise for your wake-up and sleep in time. You need to perform ” Shri Hanuman Chalisa” daily at same time ( 10 mins difference is allowed).if you are a woman then you need to perform ” Kali Chalisa” during Mensuration then come back to Hanuman Chalisa for normal days. The Genuine needy people (beggars, handicap) needs you because Shani is handicap, just feed them with compassion and love. Shani is your karam karaka so don’t cheat anyone or lie anyone for the sake of your benefit. if you life for others benefit then Shani will bestow blessings on your because Shani is other people. Be very Punctual, Dedicated and must be deviate from path with initial hurdles because Shani is TEST. Be very simple in living , No show off because Shani is reality and show off is Rahu. Don’t wear any gemstones unless you are sure for your kundli. Wearing Neelam can give you nightmares if its not suitable for your kundli. Donate cloths and shoes to mass if possible do it on Saturday. Start lighting up the mustard oil lamp(earthen lamp only ) under the Peepal Tree on Tuesday and Saturday. It is good to perform these measures during Sade Sati or Shani Dasha. These are just general measures which get elevated with particular remedy as per your kundli. Shani means devotion and mantra recitation as it is the lord of Natural 11th house (Aquarius Sign) just opp. to 5th house of Devotion and Mantra (being 7th house to any house shows the power of that any house). Well Sade Sati, as i have explained above is the influential time of Shani. Shani being the Lord of 10th house ( Capricorn- fame ) and 11 house (Aquarius -Gains) can be channelize in many ways depending upon your kundli combinations. I have many examples in my data base where my client earned huge money in Sade Sati with lot of fame. They have beautifully channelized the power and energy of shani into fruitful order. Even you can do it. You need to get your kundli analysed from Genuine Astrologer and he will definitely guide you about your Shani – ” What way HE can be pleased ” ! Down Consultation Options are Paytm Links. If you don’t want to pay through Paytm but through Credit/Debit cards or Bank Transfer Then Click on Topmost on the page.